The Science & Entertainment Exchange co-hosted a panel discussion over the weekend in conjunction with Discover Magazine at San Diego Comic-Con. Bad Astronomer Phil Plait served as moderator for the event, which featured Jaime Paglia (Eureka showrunner), Kevin Grazier (JPL and technical consultant for Eureka and Battlestar Galactica) Rob Chiappetta and Glen Whitma (Fringe staff writers), Ricardo Gil da Costa (The Salk Institute and a consultant on Fringe), and Jane Espenson (Caprica showrunner). It was a lively discourse on the interplay between science and science fiction that explored many questions regarding moral quandaries with which humanity may grapple in coming years. Ultimately, the panel demonstrated how shows like Caprica, Eureka, and Fringe serve a broader purpose of inspiring audiences to take a closer look at real-world science. “So many scientists go into science because they want to be Captain Kirk or Spock,” Grazier said. The questions that science fiction shows pose today may one day be answered in the real world… by their loving fans. 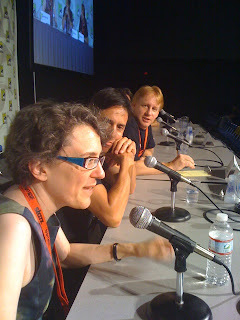 Photo: (top) Jane Espenson waxes profound while Jaime Paglia and Kevin Grazier look on. Source: Phil Plait, via Twitter.